These days most Mothers are very busy people, many working part or full-time and as a result they do not have the extra hours available to prepare and cook complicated recipes for their families. That is why, when starting your baby on solids, it is wise to begin with food that is nourishing and quick to prepare. Feeding your baby solids is a new milestone in their life and knowing exactly when and how to go about it can be confusing. A survey referenced in Reuters found many parents are unsure about when and how to best introduce solid foods to babies - survey. From 5 to 6 months old your baby can try a range of foods. Introduce one food at a time offering small amounts to start with. Try half to two teaspoons at first, gradually increasing the amount as your baby becomes more confident and consumes all the food offered to him. NCT/NHS recommends starting a baby on solids at around six months. Therefore it is important to watch for signs your baby is ready to enjoy solids. If you offer your baby food they don’t stick their tongue out and push it away. The following are Top Tips which could be helpful when Introducing your Baby to Solids. Adding a little breast milk or formula to baby rice/solids can be a way of introducing your baby to new flavours. When introducing solids it is still important to give baby his usual breast or formula milk and offer solids as a top up. It is also most important to offer solids when your baby is relaxed and happy. The environment in which your baby feeds and is introduced to solids can have a huge impact on the experience of eating. Introduce small amounts of one food at a time. Try half to two teaspoons first and gradually increase the amount of solids if your baby seems to be enjoying the new food. If your baby does not like a food the first time, don’t be disheartened. Try again with a smaller amount in a few days. It takes time for babies to learn to eat, swallow and enjoy new flavours. It can take up to several exposures to new tastes, flavours and textures before a baby is totally familiar with a particular food and will eat it happily. Start with plain, smooth, pureed single foods first. Build in new flavours and different combinations of food and textures as your baby becomes more confident. 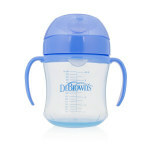 A little cool, previously boiled water can be offered from a sippy cup along with the small portions of solid food you are offering your baby. Babies learn and develop food preferences from a very early age. Once they have been introduced to solids offer them a variety of foods over the next six months to encourage healthy eating habits that will last a lifetime. Cereals and iron-fortified baby rice, however check labels for the age and stage they suit. Fruits - pears, apple, apricot, mango, plum, peach, ripe banana, avocado. Prepare meal by removing skins, pips and stones. Cook to soften and puree. Well ripened fruit can be eaten uncooked in particular mango, avocado and banana. Vegetables - Sweet potato, yam, pumpkin, potato, parsnip, taro and carrot. Prepare by removing skins and seeds and cook vegetables to soften, then puree. Beans and Pulses - dried peas, lentils, beans, chickpeas and dahl including baked beans can be slowly introduced. Prepare by - rinsing dried beans, peas or lentils, then cook and puree. Spoons, bowls, sippy cups and perhaps a blender or mouli are some of the utensils you will require when introducing your baby to solid food. All of these brands have suitable utensils for feeding babies. Buy soft tipped silicone spoons at first as they are gentle on your baby’s lips and mouth. 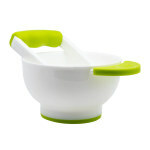 Suction bowls can also be purchased along with sippy cups, bowls and blenders for preparing food. Always ensure that your hands, the surface on which you are preparing the food, and the utensils you are using are thoroughly clean before preparing food for your baby or children. Wash and remove skins, stones, seeds and stalks from fruit and vegetables before you cook and puree them. Once cooked use a blender or push through a sieve. Add breast milk or formula to new foods as a way to ease your baby into becoming accustomed to new flavours. It is best to offer solids when your baby is relaxed and happy and in a familiar environment. Start with plain, smooth, single pureed food, smooth enough for your baby to eat at first, as this also helps him to swallow his first solid foods. Offer one food at a time, a small portion only, adding larger amounts as your baby seems happy and is enjoying the new flavours. Breast milk or formula is still your baby’s main source of nutrition until 8 to 9 months of age when you can start to offer solid foods first, followed by breast milk. Try one new food every two to four days, if your baby has a reaction to a food, this makes it easier to pinpoint which food it might be. If your baby does not like a food the first time, do not give up try again with a smaller amount in a few days. Babies are used to just one flavour; milk. Sometimes it can take them time to become accustomed to new textures and tastes. At around seven months, if you baby is happily taking pureed food from a spoon, you can introduce thicker purees, small soft lumps such as baby pasta, whole cooked rice, noodles and mashed vegetables and fruit. Soft lumps will encourage chewing, tongue flexibility and movement. Even with no teeth you can still introduce new flavours and textures to your baby’s diet. As your baby becomes more familiar with soft lumps they may also be interested in feeding themselves. This is an ideal time to introduce finger food especially if they are grabbing at the spoon or reaching for food from the plate. Offer your baby bite size pieces of soft food on a clean highchair tray or an unbreakable plate. You can also buy baby plates with a suction pad which cannot be thrown so easily to the floor. Be prepared for messy eating from now on! Always cut all finger food into bite size pieces as it makes it easier for a baby to pick up and hold, more importantly this also reduces the risk of choking. Pay extra attention to round shaped food, such as baby tomatoes, carrots, blueberry's, sausages and especially grapes. You will find lots of articles on the internet which show how easy it is for a baby to choke. For example read this - Article of chocking. Once again remember, that all babies are different, and will progress at their own pace. If your baby decides to do things a little differently, 'just perserver' and continue to offer a variety of foods. 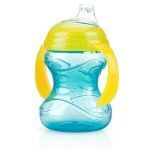 Between six and seven months your baby will also be drinking water regularly from a sippy cup, he may even be attempting to hold it himself. 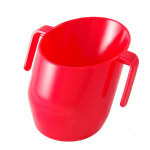 Once your baby takes an interest in holding his cup, offer it to him as often as he requires a drink and help him to place his hands on the handles of the cup, guiding it toward his mouth. This will soon become an event he will want to carry out independently; another way of asserting himself and gaining further life skills. 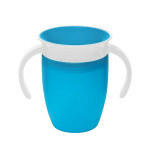 Recommended Sippy Cups are as follows. As all baby’s needs are different it pays to research the various cups online or speak to a friend about which model will be suitable for your baby. We only suggest a range of innovative products to help your little one develop towards independent drinking and move on eventually from a bottle with a teat. 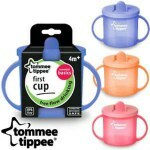 Introducing a sippy cup with water from an early stage of the introduction to solids helps to achieve this independence. As your baby gets used to lumpier textures you can move on to soft chopped up finger foods. Cooked, chopped, vegetable pieces, a baby can hold onto, not big chunks. Offer potato, cauliflower, broccoli and carrots, various fruits, small pieces of cooked pasta and tender meat, grated cheese, rusks and tiny sandwiches. Make sure the carrots are not cut in circles but cut into small pieces as they can get stuck in a child’s windpipe, oesophagus and cause choking. Grapes and blueberries must also be cut into small pieces never offered whole. Between one and two years of age children learn to vocalise and exert their independence. Meals are a perfect time to show off these skills saying, ‘no’. Food is not necessarily the problem but they decide to refuse to eat and throw food on the floor to see your reaction. Try to introduce different foods and new ways of eating from a different plate or cut their bread into shapes, introduce finger foods they can help themselves to that they have not eaten before as a way of distraction. Try to feed young children before they are overtired or very hungry as this would aggravate irritability. Once toddlers are eating a varied diet similar to the rest of the family, milk remains important but is best offered after a meal or between main meals as a snack. Garofalo Bambino is tiny pasta, that can be bought from Amazon and Ocado. The size of the pasta is ideal for a small baby. Useful Recipes for 6 month old Babies. PREPARE - wash, peel and remove pips from the pears. Cut them into slices and steam or cook in a pot with a little water until soft. Puree using which ever method you have chosen to a creamy constituency. Offer a small portion at first. Apples, plums, peaches, apricots and mango can also be prepared this way. Mango, banana and avocado can all be pureed without being cooked but only prepare this way if very ripe. Pears and apples or any chosen fruit combination can be mixed together, once you have ascertained there is no allergic reaction, to any of the fruits. Fruit, as prepared above, can also be added to baby rice/cereal to create more variety. PREPARE - Wash, remove skins and seeds. Cook vegetables to soften, then puree to a creamy consistency Introduce one vegetable at a time to ensure there is no allergic reaction. Sweet Potato and Carrot - Wash, peel and slice the sweet potato and carrot into small pieces, steam or boil gently until soft and ready to puree. Mix with a little breast milk or formula if necessary to achieve a creamy consistency. Offer a small portion at first and then increase the quantity as your baby consumes more. Sweet Potato, pumpkin, carrot potato, yam, parsnip and taro are all suitable vegetables to introduce to a 6 month old baby. PREPARE - Cook and puree. Beef, chicken, fish, lamb and pork can now also be introduced to your baby’s diet. PREPARE - Wash peel and prepare the potato and carrot. Wash and check that the fish has no scales or bones. Place the vegetables in a steamer or simmer gently in a pot with water to cover. When the vegetables are nearly ready to remove from the heat drop in a small boneless piece of your chosen fish and poach for a further few minutes until cooked. Drain the vegetables and fish retaining some of the vegetable water to mix once the food is pureed to form a creamy consistency. Another way of preparing a nourishing supper or lunch for your baby is to prepare a pureed vegetable sauce with avocado and pear puree and add a spoonful of Garofalo Bambino baby pasta. Prepare and cook this according to the instructions on the packet. PREPARE - rinse dried beans, peas or lentils and cook according to instructions on the packet – puree to consistency required. Dried beans, peas and lentils, baked beans, chickpeas and dahl can now be included in your baby’s diet. The journey to independent drinking starts when you offer your baby water from a sippy cup.